Click here for a service preview – Besides a preview of the service music and bulletin for upcoming services, this link also provides access to sermon texts, podcasts and live-stream service videos. The Annual Meeting of the parish will take place this Sunday, January 27, starting at 9:30 a.m. The meeting will temporarily adjourn for the 10:30 service, then continue with a potluck brunch afterward. There is no 8:00 service, to allow for the entire congregation to meet and worship together. One order of business is to elect Vestry officers and members. The nominees are as follows. Note that wardens and treasurers serve for three years, but are nominated each year for three consecutive one-year terms. Learn more about the the new warden nominee and the new Vestry nominees by clicking here. Choral Evensong with Three Choirs, January 27 at 5 p.m. The January service of Choral Evensong will feature the St. John’s Youth Choir with guests from the youth choirs of St. James’s Episcopal Church and the Church of Christ, Newington. 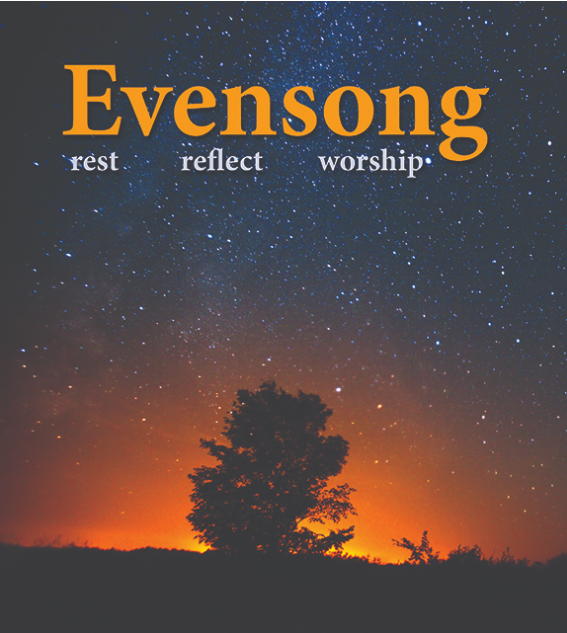 Evensong is an ancient service that includes readings, chants, and prayers and offers worshippers a quiet, reflective space in which to be renewed and connect with God. All are invited — bring a friend. The rector will lead an adult inquirers/confirmation class on the four Sundays in February (February 3, 10, 17, 24) at noon. These classes are open to ANY adult who would like to learn more about Christian and Episcopal beliefs, history and traditions. While these classes are especially appropriate for adults interested in becoming confirmed, all are welcome. Lunch will be provided. 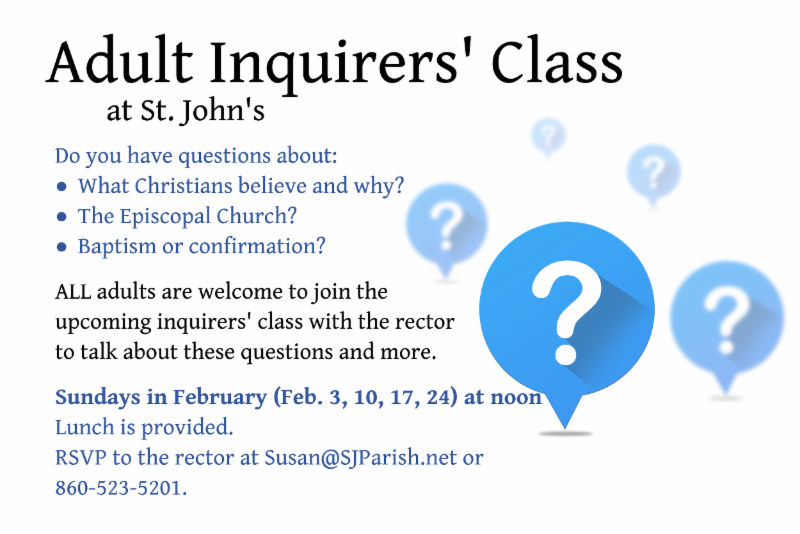 Please contact the rector at susan@sjparish.net if you are interested. Organ concert featuring Scott Lamlein & others, January 25, 7:30 p.m. This Friday evening at 7:30 p.m., the Hartford chapter of the American Guild of Organists will hold a concert at St. Peter Claver Church by members Scott Lamlein, Kari Miller, Cheryl Wadsworth, Nathan Lively, Noah Smith and Michelle Horsley Parker. St. Peter Claver is located at 47 Pleasant Street in West Hartford. Music to be played includes Buxtehude’s Toccata in D minor, Hindemith’s Sonata 2 and much more. “Beloved Community” concert, rescheduled for Saturday, January 26, 7:30 p.m. The “Building a Beloved Community” concert that was cancelled last Sunday due to weather has been rescheduled for this Saturday evening, January 26, 7:30 p.m. at St. John’s. The concert, which is sponsored by and benefits Hartford Habitat, features St. John’s members Margaret Beers and Cleveland Williams. For tickets and more information, go to HartfordHabitat.org. Handel’s Messiah, February 9 at 7:30 p.m.
Full of famous choruses—such as the great Hallelujah—and based on Italian folk songs and carols, Handel’s Messiah tells a story of wonder and triumph. Experience this timeless masterwork in its earliest version, presented by the American Baroque Orchestra and Singers on Saturday, February 9 at 7:30 p.m. Snow date: February 16th, 7:30 p.m. The concert is free admission, suggested donation $20. The Jazz Eucharist that was cancelled last Sunday due to weather will take place at the 10:30 service on February 10. Once again, the Hot Cat Jazz Band will bring Gospel and Dixieland jazz style to the service music and hymns. Please join us for this favorite annual event. Do you want to travel to the Holy Land? If enough people show interest, Bill and Hope Eakins will lead a 12-day pilgrimage from November 27 to December 8, 2020. The trip would be similar to the parish trip in September 2018, with guide Iyad Qumri. The land portion of the trip would cost approximately $2,500 (double) to $2,950 (single). If you might want to join the group, please contact Ellen Dollar in the church office (860-523-5201 or ellen@sjparish.net) and ask to be put on the Holy Land pilgrimage list. Year-end statements listing monetary gifts made to St. John’s in 2018 were mailed last week to everyone who donated $25 or more to St. John’s last year. If you have not received a statement, or if you have questions about it, please contact Peggy O’Toole, our financial administrator, at 860-523-5201 x 311 or peggy@sjparish.net. Please note: If you donated to Music at the Red Door in the latter half of 2018, after it was incorporated as a nonprofit organization, you will receive a separate statement detailing those gifts.